A view of the packed hall from the Armour Stage at Symphony Center, Chicago. Photo by Todd Rosenberg. Music Director Riccardo Muti and the Chicago Symphony Orchestra and Chorus take a bow following Opening night of Verdi's Otello at Symphony Center in Chicago, IL in February 2011 – file name is the caption! Photo by Todd Rosenberg. A view of the front of Symphony Center in Chicago, IL. Photo by Todd Rosenberg. The buildings behind Millennium Park’s Pritzker Pavilion were lit up with “CSO” and “Muti” during the “Concert for Chicago” on September 19, 2010. Photo by Todd Rosenberg. Riccardo Muti leads the CSO in performance. Photo by Todd Rosenberg. Riccardo Muti leads the CSO during the “Concert for Chicago” at Millennium Park on September 19, 2011. Photo by Todd Rosenberg. The view of Riccardo Muti and the crowd during the “Concert for Chicago” in Millennium Park (Chicago) on September 19, 2010. This free concert marked the beginning of Maestro Muti’s first season as music director and was attended by over 25,000 people. Photo by Todd Rosenberg. Another view of the front of Symphony Center. Photo by Emma Larsson. 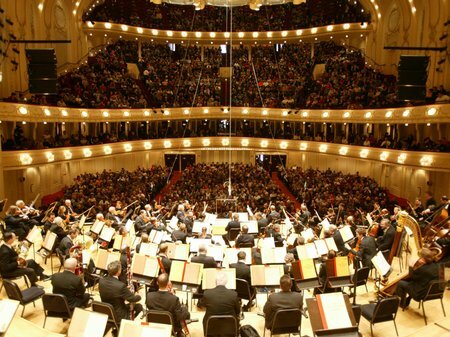 An overhead view of the Chicago Symphony Orchestra on stage at Orchestra Hall at Symphony Center in Chicago. Photo by Todd Rosenberg.